Trivandrum Lodge is an upcoming Malayalam romantic drama film written by Anoop Menon and directed by V. K. Prakash. 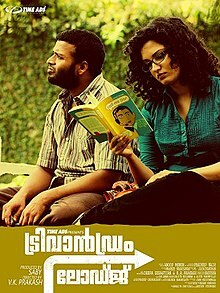 It stars Jayasurya,Honey Rose and Anoop Menon in the lead roles. The film is produced by P.A Sebastian under the banner of Time Ads Entertainment and features music composed by M. Jayachandran, whilst cinematography is handled by Pradeep Nair and is edited by Mahesh Narayanan. The film is about lodge mates who have been staying away from their families for years, the story is told in a distinct and different matter. Trivandrum Lodge tells a story of an array of interesting characters residing in an ancient lodge in Kochi. With a very unconventional screenplay which unfolds through these peculiar characters, their experiences and transformations rather than sticking to the usual beginning, middle and end format. After the bumper success of the movie ‘Beautiful’, director V K Prakash is getting ready to meet the audience with another feel good movie. Titled as ‘Trivandrum lodge, the movie will bring together the key names behind beautiful once again. While Anoop Menon will be in charge of the scripts, Jayasurya will come up in the lead role. Jayasurya was chosen to be play the character without further remarks, initially Padmapriya was chosen to play the female lead, but opted out after some changes in the script because she believed there is very little scope for her to perform. Rumours said that the role was later given to Meghana Raj, but the role was actually given to Honey Rose. Who came through with a different character as Dhwani by the film. The film marked a comeback of sorts for veteran singer Jayachandran who had previously acted in 80's flicks such as 'Nakhakshathangal' and 'Lekhayude Maranam Oru Flashback'. Bhavana was casted to play a very small cameo role as the wife of the Anoop Menon's character in the film, and that the actress had agreed to do it readily. Devi Ajith was casted after a big break to play Zarina, a close friend of Dhwani. The story of the film revolves around the lives of a group of people who stay in the lodge. The lodge is just a metaphor for the happenings in the film, which won't be having a conventional beginning, middle and end,"" says the director. "It will be a tale of love, lust and longing. Each character evolves as the film progresses, from situation to situation." The actors have been seen in unusual looks for the film; Jayasurya with braces on his teeth and a chin curtain beard." Jayasurya as Abdu, a man who does any job for living which include being masseur at a spa and being the driver of Ravisankar. Honey Rose as Dhwani Nambiar, a divorcee writer who comes to the lodge to write a story. Master Dhananjay as Arjun, son of Ravisankar. The film is expected to be released in September 21 this year. "A tale of love, lust and longing" Was its promotional caption.